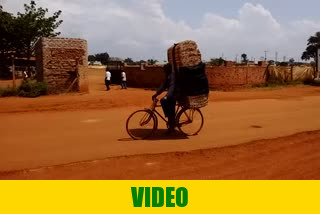 The Ugandan bicycle transport is very interesting. Almost everything may be transported by bicycles, including coffins, goats, pigs, 20 meter long heavy wires, large wooden sheets, beds, Coca-Cola boxes, and 20-30 plastic chairs. Just anything goes for 500 to 2,000 Ugs. per round.